← The inspired Mother’s Day gift guide! Sometimes in life, you have to take risks. This blog was one of my biggest. I thought about it for years before I actually got started. It took me 6 months to come up with a unique name that made me happy. I was afraid of what people would think, I worried if they’d like it, and if they’d read it. I worried that I wouldn’t have the material or the commitment I needed to make it work. I worried that because it was a risk, and I didn’t know the outcome, that simply exploring this creative medium was a bad idea or a waste of time. When I was a teenager, I read The Alchemist by Paulo Coelho. 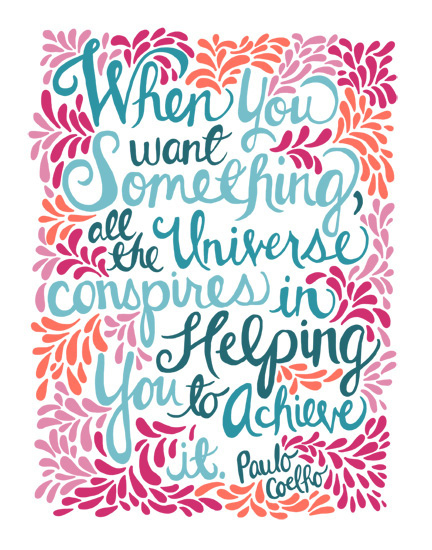 He states that “When you want something, the whole universe conspires in helping you to achieve it”. Those words helped propel me through many ventures in my life, but at one point, I lost touch with the magic. When I say magic, I mean the feeling that I am a part of something greater than myself, that I have a purpose. I mean taking risks based on a hunch or my intuition. I mean observing synchronicities, and not passing them off as flukes. I mean wanting something that seems impossible, and then witnessing it transpire before my own eyes. It feels like magic. But first, I had to know what I wanted, and how can you know when you’ve lost touch with your inner voice? Since I started this blog, I no longer worry about my initial fears and I focus on creating momentum, repeating habits, being flexible, following my intuition, and trusting it without over-analyzing. As you can imagine, it is incredibly freeing for a former control freak. I no longer focus on my fears and waste time. I have that freedom because through practice, my creativity is moving at light speed. I can do more and faster. I let the chaos pass by me and don’t let it stress me too much. I just accept it. What’s the worst that can happen? Failure? Someone not liking one of my stories? Who cares? Most people are way too busy focusing on their own life. Worrying about what other people think is an incredible waste of time. If that’s holding you back from doing something that your entire being is screaming for you to do, that needs to change. Knowing this took practice and it took risk. I had to leap with my eyes open, before I could fly. I also had to work very hard. When you get that to this point, you want to shout it from the rooftops. You want to share it. You want everyone to know it, so that they too can experience it. I have also been looking for a partner to help me with another idea that’s been stewing in my brain since high school. It’s a biggie and it involves bringing the cozy sweater café to life. That’s all I’ll say for now. Well, I can also tell you that I think you’ll be excited…and I hope you will be a part of it. Stay tuned for more very soon! Coming in a few days!!!! Very excited indeed!! What could it be??? Can’t wait to find out!